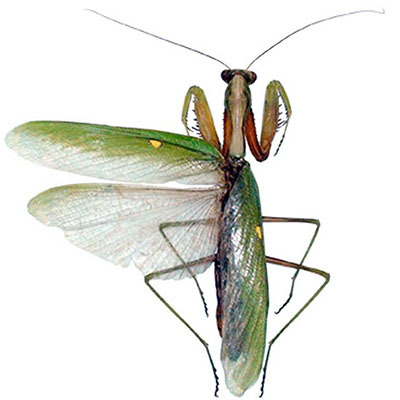 (Mantodea) This order includes 15 families worldwide having more than 2,400 species distributed into more than 440 genera spread all over the world. The insects are large predators. Their body is elongated with a cylindrical triangle head that moves in all directions. The prothorax is long, making it the longest part of their body. Forelegs are mutated for hunting. The coxa and tarsus contain thorns that help in hunting. The metamorphosis type of this insect is incomplete (egg - nymph - complete insect). Females deposit eggs in a frothy mass that is produced by glands in the abdomen. This froth then hardens, creating a protective capsule around the eggs. 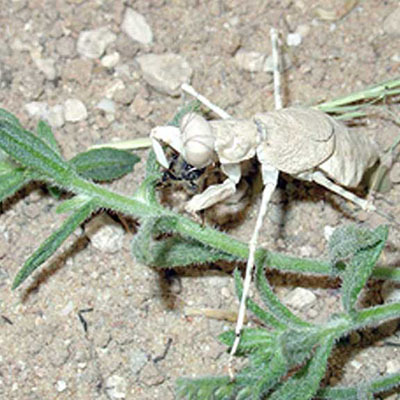 These insects move around by walking. They are predators in the stages of nymphs and adults. (Empusidae) This family includes 30 species distributed into slightly less than 10 genera. Mantis phylogeny is not clear as majority of mantis families or subfamilies are not homogenous groups. Species of this family can be so diversified and they are characterized by a very wonderful appearance mimicking, for example, the shape and colour of a lizard. However, they are also variable in size. Nymphs and adults are predators existing in the same environment and they are big consumers of other Arthropoda species. 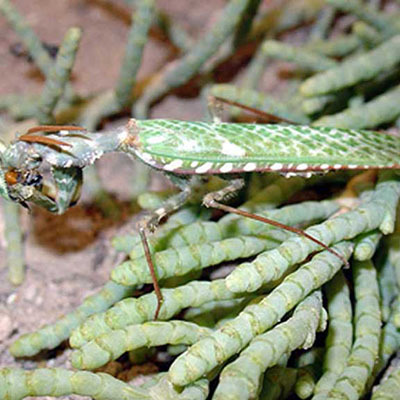 Mantis species colonized all plant families, from arid deserts to rainforests on the equator.